It should, of course – but you have to take the right steps to make it happen. The fact is, selling real estate is a tough job. With about one million Realtors working in the U.S., the competition for every commission is fierce! Be THE one in a million that buyers and sellers think of first. Dominate your real estate market – listing more homes and serving more buyers than even your top competitor. Spend less time (and gasoline) driving from place to place. Go home each evening with a smile on your face. Forget luck. Take charge of your future today. A few simple changes in how and where you market your services can bring dramatic results in both your income and your job satisfaction. How do I know? Because I did it. When I got my first real estate license in 1985 the market was in a downturn. Everything was for sale, but buyers were few and far between. Agents practically shoved each other out of the way to get at anyone who resembled a buyer! But no one was marketing. I doubt that anyone had been taught to market. Everyone ran the same “homes for sale” ads in the local newspaper. Sometimes an agent ran a little block ad saying something really attention-grabbing. Something like their name and the agency they worked for and a line that said “Let me help you find your new home.” Wow. Others said “Your neighborhood expert” – but of course with no proof to back up the claim. My broker knew a little – she always said “Put the reader in the home.” The trouble with that was, we were supposed to do it in the space of a tiny want-ad. 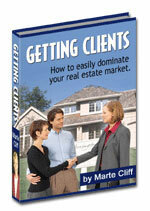 By the early 90’s I had read every book I could find on real estate marketing and was anxious to try some new methods. But I worked in an agency with a broker who insisted on “business as usual.” So I got a broker’s license and opened my own agency in 1993.
Who ever heard of a woman real estate broker? They predicted I’d last 6 months. We fooled them – by the end of our second year we had captured over 50% of the market – competing against 6 other firms. To accomplish this feat, I had to learn what no broker and no real estate class had taught: How to market effectively. Do you know the reason why some agents fail – while others become wealthy? *Hint: It’s a matter of focus and consistent action. The book that will bring your real estate marketing efforts into focus and electrify your career – starting tomorrow. One simple task that takes less than 10 minutes of your day and can raise you head and shoulders above your competition – and get buyers and sellers all over town talking about you. Easy methods for becoming the recognized expert in your chosen niche. What are three new listings worth? How about 23 new listings? What would it do for your lifestyle if you closed 2, or 3, or 4 times more sales to buyers? What would it be worth to you if you could afford the luxury of firing an obnoxious client or customer? My guess is that any one of those things is worth at least 100 times the cost of Getting Clients. And not only that, I’ll guarantee your satisfaction. I know that if you use the advice in Getting Clients you will boost your income and your job satisfaction. But if you read it and decide it won’t work for you, you can contact me for a full refund. Just write me at: marte@copybymarte.com.